Cloud computing is fast becoming the norm for businesses and organizations in ASEAN who want to remain competitive compared to their peers in China and the West. Compared to conventional computing, it ooffers many benefits — considerable capital investment savings, unlimited computing power, and flexibility that allows users to scale up or down depending on computing needs. 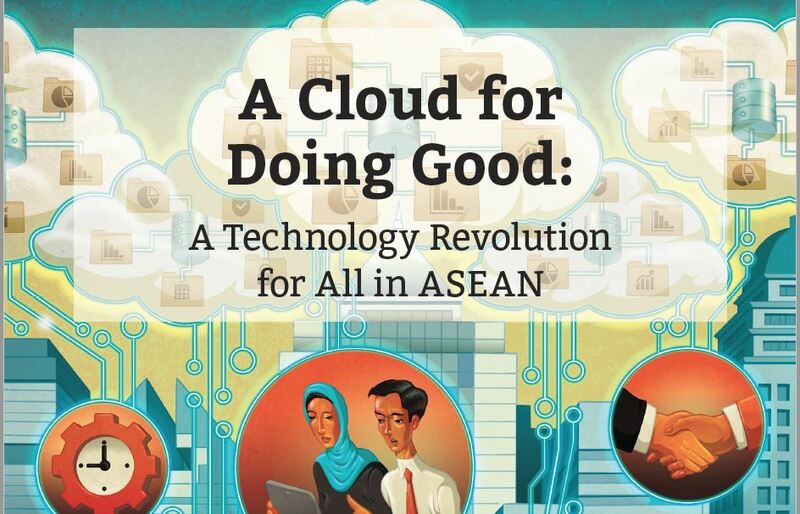 “Cloud computing is at the heart of the current technology revolution and digital transformation going on in ASEAN. This is why it’s imperative to look into the trends and best practices of other nations so that we can adapt more readily to the what is an increasingly digital global economy,” said Dr. Astrid S. Tuminez, Regional Director for Corporate, External and Legal Affairs for Microsoft (Southeast Asia). Cloud computing can be harnessed in a myriad of ways. For ASEAN, it can lead to a more efficient and integrated public sector, especially for national governments and cities delivering frontline services. In India, the government makes use of the cost-effective cloud via the Aadhaar card, a national biometric identification system. Big cities of ASEAN—Manila, Jakarta, Bandung, Bangkok, Ho Chi Minh and Singapore—can similarly benefit by delivering more citizen services powered by cloud computing. Jakarta Smart City program, Singapore Smart Nation, and, farther afield, Tel Aviv smart city transformation are some examples of how cloud solutions are being deployed to improve city services and citizen participation in government. In rural areas, too, the cloud can be transformative. In India, for example, a Microsoft collaboration with ICRISAT has shown how cloud-powered data analytics can enable farmers to sow their seeds at the right time and gain a 30% increase in crop yield. In Myanmar, small loans are being disbursed in highly remote places through a secure microfinance platform powered by the cloud. Cloud computing is not just for large organizations, as small and medium enterprises stand to benefit from the efficiencies of cloud computing as well. SMEs make up 95% of all businesses in ASEAN, generate 23% to 58% of GDP, employ 57% to 91% of the labor force and contribute 10% to 30% of exports. With the flexibility offered by cloud computing, SMEs need not worry about significant, upfront capital costs as they seek to expand to new markets domestically and in the region. Small and medium-sized financial services firms, which require huge investments in information technology, can become more competitive because they can be more productive through automation, market their products more widely at lower cost, and collaborate with others across previously unmanageable distances. Manufacturing is a huge industry in ASEAN, and it is the main driver of growth in Vietnam, Thailand, Malaysia, Singapore and Indonesia. Cloud-based, open internet of things operating systems can reduce manufacturing costs, improve production quality and productivity, provide flexibility and efficiency, shorten the response times to customer requests and customer demands and open up new and innovative business opportunities. By shifting to cloud computing, manufacturing firms in ASEAN can remain competitive compared to their peers in China and the West. In the Philippines, one of the biggest industries is business process outsourcing. It is the world’s top destination for business process outsourcing and will remain in the top ten in the coming years. The industry generates 9% of GDP and employs 1.4 million relatively well-paid workers. The industry very much depends on the English language competency of its young population as well as on the reliability and cost of its broadband infrastructure. Improvements in cloud computing efficiency therefore will help keep the industry competitive. Additionally, the Philippines, Indonesia, Cambodia, Vietnam, Thailand and Myanmar receive considerable remittances from their migrant workers. In 2016, some USD63 billion have been remitted to these countries, about half of which went to the Philippines. Cloud computing can help reduce the cost of remittances as local banks adopt digital payment systems using cloud-based solutions. Myanmar will particularly benefit by shifting from a largely cash-based economy to mobile banking solutions. Today, Microsoft is releasing “4IR: 4ASEAN and 4theFuture,” referencing the Fourth Industrial Revolution and four case studies on cloud readiness of ASEAN, focusing on the Philippines, Singapore, Myanmar, and Vietnam. It looks at key data about the readiness of these nations to adopt widespread cloud computing, as well as potential barriers to digital transformation. The case study also looks at cloud solutions and best practices of other nations that can work for ASEAN.